Demetri Martin rose to relative obscurity when he started doing stand-up comedy in New York City at the end of the 20th Century. Later he became a writer at Late Night with Conan O’Brien and then a regular performer on The Daily Show with Jon Stewart. In 2003, Demetri won the Perrier Award at the International Fringe Festival for his first one-man show, If I. He released a comedy album called These Are Jokes and then created and starred in his own television series called Important Things with Demetri Martin. 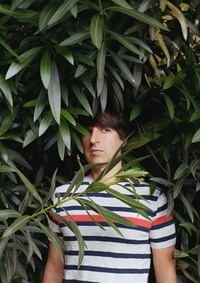 His first stand-up comedy special, Demetri Martin. Person is considered by many to be his longest and only hour-long stand-up comedy special. Martin has appeared in movies as an actor, most recently in Steven Soderbergh’s Contagion and most lengthily in Ang Lee’s Taking Woodstock. His first book, This Is a Book by Demetri Martin is a New York Times Bestseller. At the 2016 Tribeca Film Festival, Demetri Martin’s film Dean won The Founders Award for Best Narrative Feature.